The Basic Diagram template contains general shapes, such as boxes, stars, and arrows, that can be used to illustrate concepts. Basic diagram refers to a specific diagram type that uses simple shapes. For information about how to create other types of diagrams, see the article for that diagram type. For example, for flowcharts, see Create a basic flowchart, or for organization charts, see Create an organization chart. Under Template Categories there is a row of folders. Click the General folder. All the templates in the General category appear. Double-click the template titled Basic Diagram. 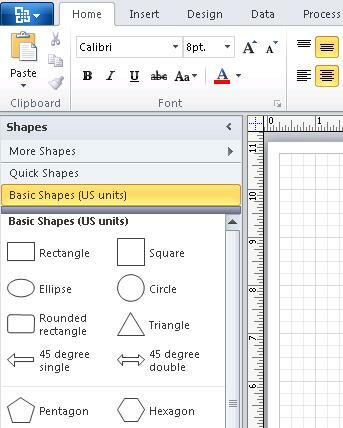 The template opens with a blank drawing page and the Shapes window, which contains a set of shapes labeled Basic Shapes. Drag a few shapes from the Basic Shapes stencil onto the drawing page. Connect the shapes by using the arrow shapes. Arrow shapes have endpoints with connectors that you can glue to other shapes. When you drag an endpoint of an arrow to another shape, connection points appear as small x marks. When you drag an endpoint over a connection point, the endpoint turns red when it is ready to be glued. When you glue an arrow to a shape, the arrow remains attached to that point even if you move the shape.